Please note: I saw the press premiere of this production for free on the courtesy of Svenska Teatern. After last year's heavy musical epic Kristina från Duvemåla, Svenska Teatern is now doing something quite different: Djungelboken, The Jungle Book, is an originally Hungarian show intended for the whole family. 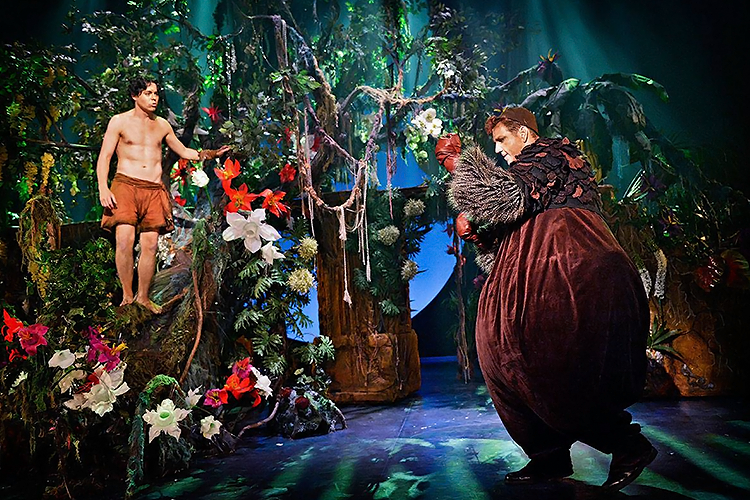 Partick Henriksen as Mowgli and Arne Nylander as Baloo the bear. If you're planning a trip to Finland and want to see theatre but don't speak either of the country's languages, this (like Tampereen Teatteri's Les Misérables) might be an option for you: there will be subtitles available in English, Finnish, and also in Swedish, the language the show is performed in. I didn't get a change to test them in the press premiere, the subtitling machines weren't available yet. But seeing the system was already in use during Kristina, I'm sure there won't be problems once the machines are available again. As for the show itself – I wasn't really enamored by it. But good things first: it looked absolutely great! The costumes, by Erika Turunen, reminded me of Lahden kaupunginteatteri's production of Cats (which I adored): they were imaginative and surprising, with bright colours and wild designs. And still, you could easily tell which animal was which. A perfect balance, I think. A tiger doesn't always have to have stripes all over to look quite impressive! The set, by Erik Salvesen, was lovely too. There were no set changes, but there were enough details that the scene didn't get boring at any point, and different lights (by Tom Kumlin) did wonders. I especially liked the glow-in-the-dark details. It was amazing to see how a lighting change could transform the set into a whole new world. The costumes weren't the only thing that reminded me of Cats: the structure of the show did, too. Well, unlike Cats, Djungelboken has a plot – but hardly any songs advanced it. Instead, they were Cats-type spectacles that introduced different animals to the audience. Since the story was mostly told in dialogue scenes, and felt a bit lacking even so, I had a hard time getting into the events and feeling for the characters. On the other hand, though, it's possible to enjoy Djungelboken purely as a visual spectacle. The dancing was good and the fighting scenes looked impressive. This production didn't have a live orchestra, and I'm pretty sure some of the chorus singing was also recorded. Apart from Åbo Svenska Teater's two-nights-only production of Terje Vigen a couple of years ago, I don't think I've ever seen a musical performed without a single live musician. Sure, when you record, you can mix and edit, remove the mistakes and be sure that your musicians are never out of tune... But what happens if a live singer messes with the rythm or accidentally skips a line? A live conductor could try fixing the situation somehow, but a recording will just go on. There were no problems in the press premiere, though, and I have to admit the recorded tunes sounded great. So it's not necessarily a bad solution, though it's hardly ideal either. Some of the singing was also less than ideal. Though the whole cast did a nice job in the acting department, some of the actors simply didn't have the vocal talent required for their roles. 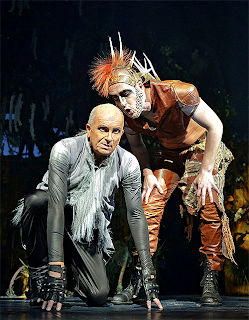 Mowgli and Tuna's (Patrick Henriksen and Cecilia Paul) duet was maybe the low point of the show. I'm no expert on music, so I can't tell you what went wrong. I can just say that neither of the singers sounded pleasant. On the other hand, though, some of the cast members were great singers. I especially enjoyed Birthe Wingren as the panther Bagheera – you can't really go wrong with her, I believe. Earlier this fall, I predicted that this production would be worth seeing for Simon Häger as the snake Kaa alone. Turns out I was right. He was definitely the highlight of the show for me. Narcissistic, cruel, charming, and absolutely fabulous in both his old and new skins. And I'm not alone: both ladies I saw the show with were smitten, too. All in all, despite all its faults, I'm glad I saw Djungelboken. I wouldn't see it again, but going once was worth it for the visuals and some fun songs (and Häger's Kaa). I'm sure I would've been quite into a show like this ten years ago, when excitement and action were still more important to me than fully coherent storytelling and top-notch vocal performances. This show might be a bit scary for the youngest children, but at least the kids around me seemed rather excited. So, if you're looking for a show for your kid that won't make you fall asleep either, book tickets for this one. Others might want to think twice. My boyfriend likes to copy watches.Best Luxury Replica Watch Brands When you buy it back, this gorgeous replica watch is amazing. The perfect weight and quality are very good. The price is still so cost-effective,Luxury replica rolex watches this copy watch is very special, just like his dial.